Take your Thermomix ® cooking to the next level with this inspiring collection of more than 60 recipes from Thermomix ® consultants and users. We ensure Daily Asian Cooking is an essential companion for any enthusiastic Thermomix ® cook. 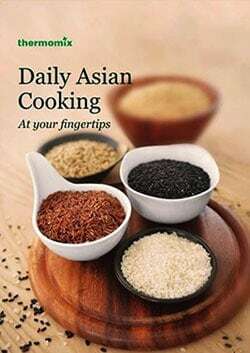 More than just a cookbook, Daily Asian Cooking is a comprehensive guide to discover new ways ad endless possibilities of using your Thermomix ® as you whip up quick and simple snacks, or embark on complex multi-part culinary dishes. A compilation of nearly 180 delicious Thermomix® recipes, the Basic cookbook is complimentary with every Thermomix® TM5 purchase. This hardcover cook book includes essential Thermomix® recipes, tips and hints to get you started with your Thermomix® TM5 immediately. From basics such as cooking rice, eggs and pasta, to preparing bakes such as bread, pizza dough, soups, pies, tarts, cookies, cakes, ice-creams and other desserts, the TM5 Basic Cookbook gets you and your family to start having fun cooking sumptuous dishes together. Additionally, the TM5 Basic Cookbook also include information that will guide you to make the most of your Thermomix® and tips for converting conventional recipes for your Thermomix®.